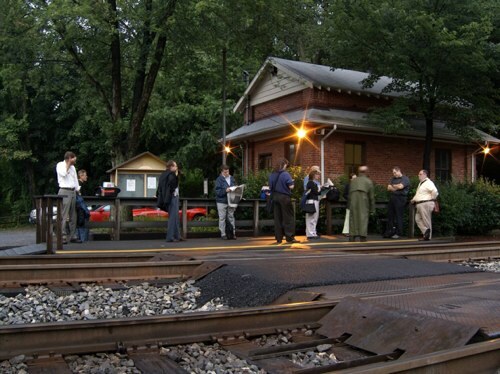 The playwright imagines a Purple Line train platform like this one, at MARC Brunswick Line's Barnesville station. Photo via Tracks: The Musical. EMBARQ and the World Resources Institute studied the proposal and found that bus rapid transit (BRT) along the route would actually cost less, offer similar services, and fight global warming better than light-rail cars. Despite this analysis, which generated a lot of debate, Stregevsky and White envision a light rail scenario for their song and dance tribute. “Tracks” is set in 2014 when the Purple Line, a 16-mile proposed light rail project [Editor’s note: Maryland’s Governor has not chosen a preferred alternative, yet, but light rail seems to be the local favorite.] running from Bethesda and New Carrollton via Silver Spring, has supposedly been completed. Most of the action and the 23 musical numbers take place on the platform of an isolated station at the extreme end of the line. The transit authority has announced that unless at least 18 riders use the station every day, it will close. The station’s loyal users, aware that just a few of them could decide the fate of the station, welcome a newcomer, Duran Longshaw, a Lexus driver in withdrawal who is bitter about taking the train. Longshaw learns the ways and habits of transit users and grows to love the Purple Line, and sheds his class snobberies. Along the way, several of the characters fall in love. Longshaw marries a woman who sells flowers at the station, while the Jewish songwriter dates the Iranian banker. And in the end, the station is saved. Tags: bus rapid transit (BRT), light rail, LRT, Maryland, mass transport, monorail, purple line, Train, United States, Washington, D.C.